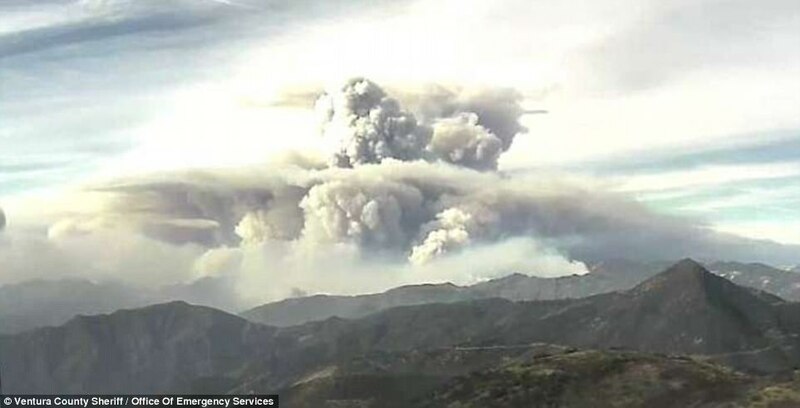 Giant Smoke-Generated Mushroom Cloud Above California Mountains Causes Huge Updraft and Threatens to Spread Wildfires – Coercion Code – "Dark Times are upon us"
An ominous mushroom cloud was spotted above California Monday as one of the most destructive wildfires in the state’s history crept relentlessly up the Pacific coast. 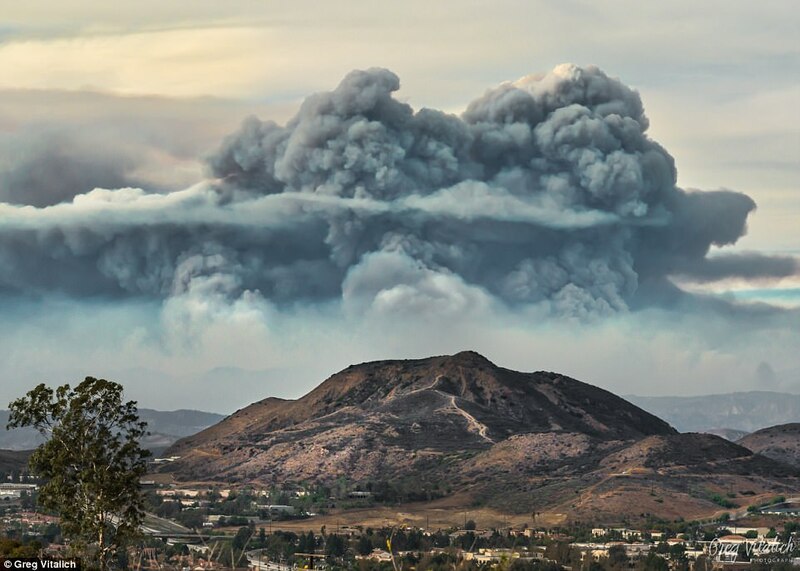 The weather phenomenon, which resembled an erupting volcano or a nuclear bomb, was seen above the San Ynez Mountains of western Ventura County in the Los Padres National Forest, near Santa Barbara. The billowing Pyrocumulus cloud, also known as a fire cloud, stretched up almost 30,000 feet high. 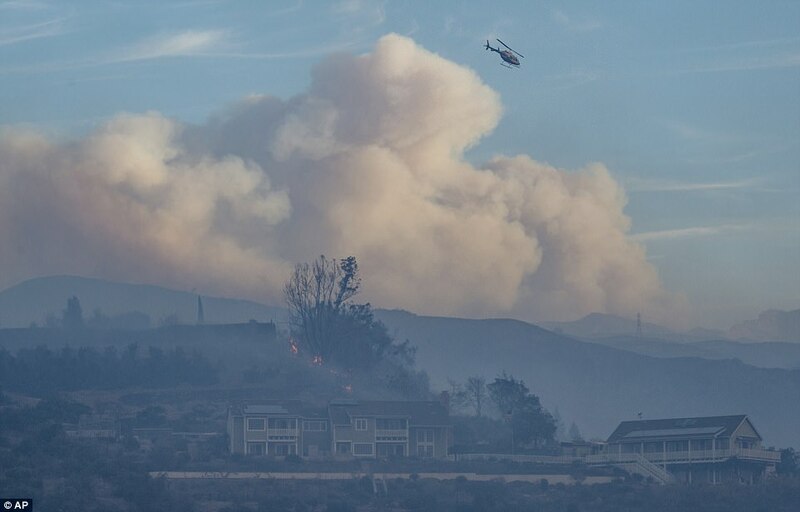 Eric Boldt, a forecaster with the National Weather Service office in Oxnard, told San Francisco Gate that the cloud was created by similar forced to a thunderstorm – and its strong winds could be responsible for helping spread the Thomas Wildfire on Sunday as Calfire grew 50,000 acres to 230,000 acres. 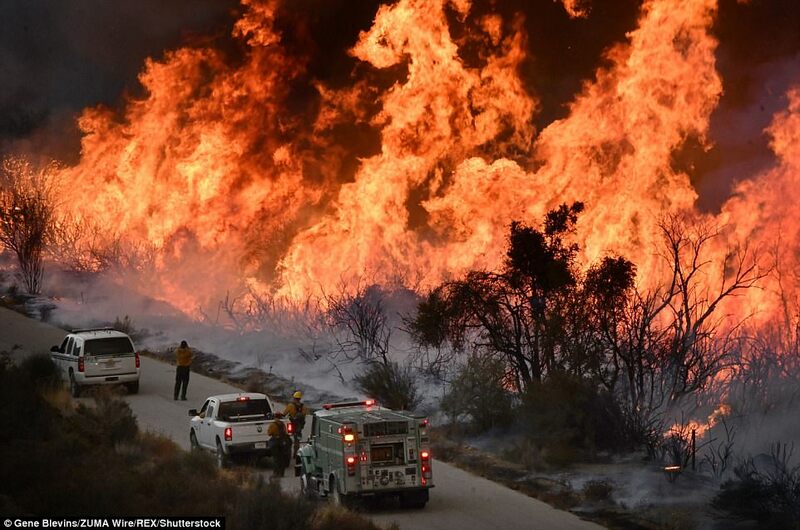 It is now the fifth worst fire in Californian history. ‘When we see these clouds billowing so tall, it’s the same mechanisms that are happening with a thunderstorm,’ he said. 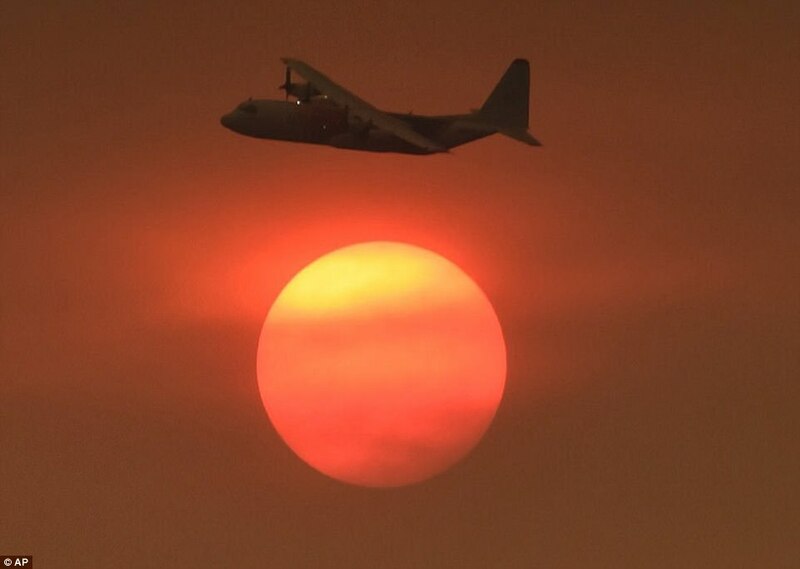 Thousands of firefighters were battling the blaze on Monday as it crept relentlessly up the Pacific coast and forced new evacuations. 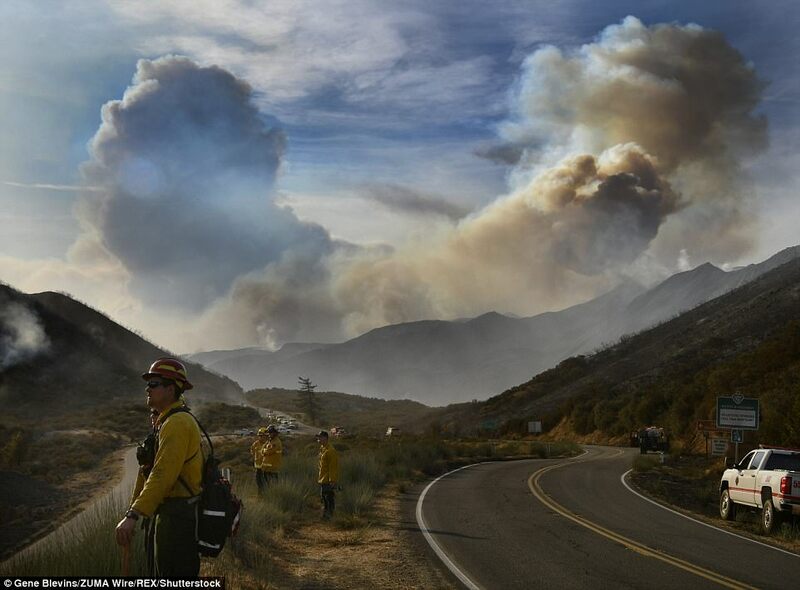 As a wildfire near Los Angeles was brought under control, fire crews were being redeployed to battle the Thomas Fire northwest of America’s second-largest city. 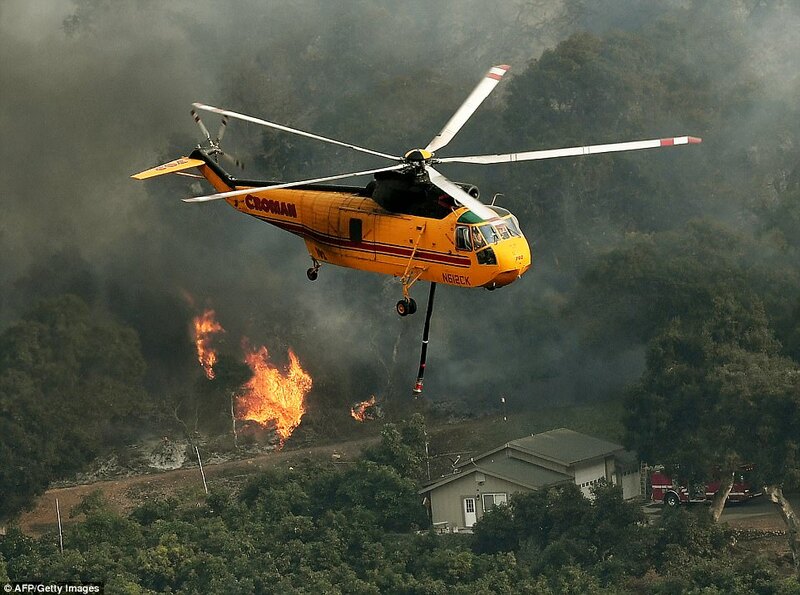 Fixed-wing aircraft and helicopters were assisting nearly 6,400 firefighters trying to keep the Thomas Fire away from beachfront towns south of the historic city of Santa Barbara, the California Fire Department (Cal Fire) said. ‘Gusty northeast winds will cause the fire to threaten areas of the city of Santa Barbara,’ which has a population of 91,000, Cal Fire said. 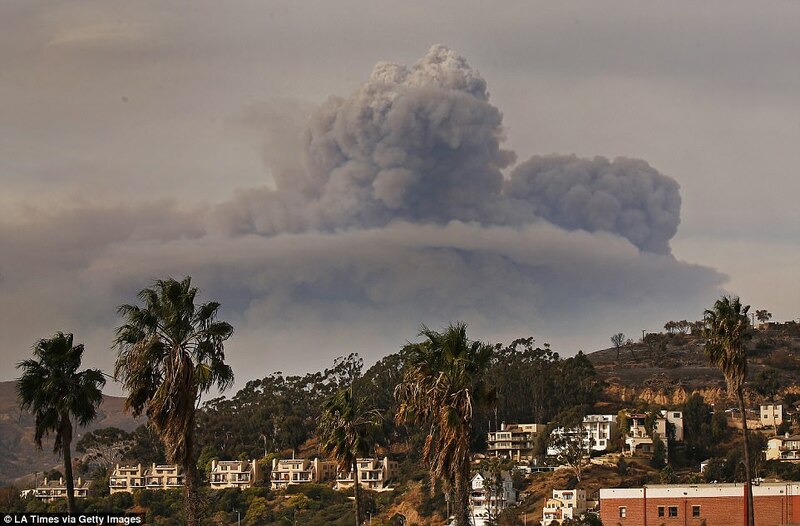 Eric Boldt, a meteorologist with the National Weather Service in Los Angeles, said he did not see any immediate respite to the dry, windy conditions that are fueling the blaze. The Thomas Fire has burned 230,500 acres since it erupted a week ago, Cal Fire said, making it the fifth-largest fire in the state’s history. 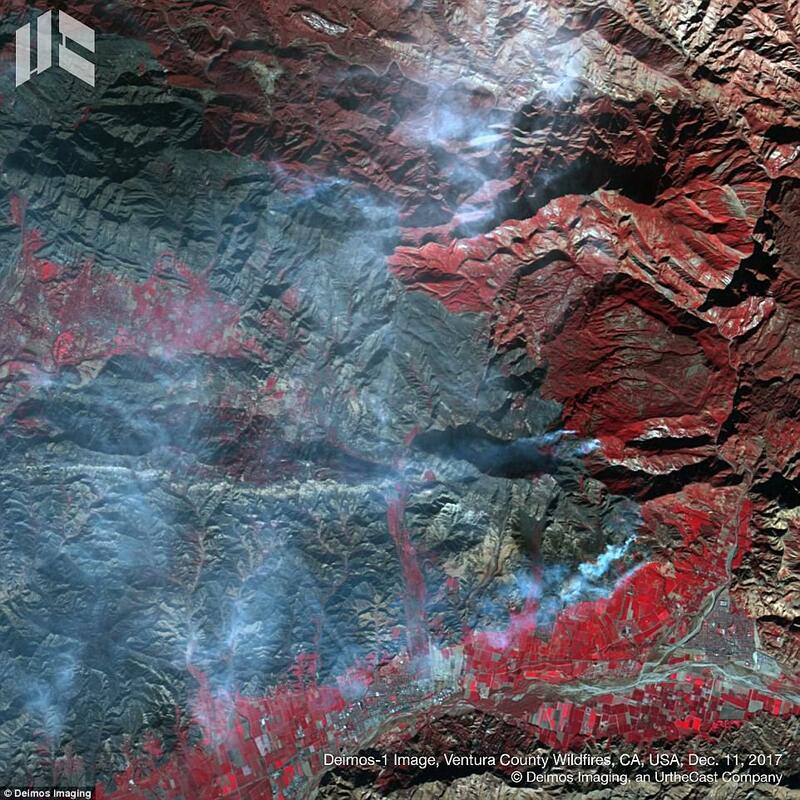 It was only 15 percent contained as of early afternoon Monday. 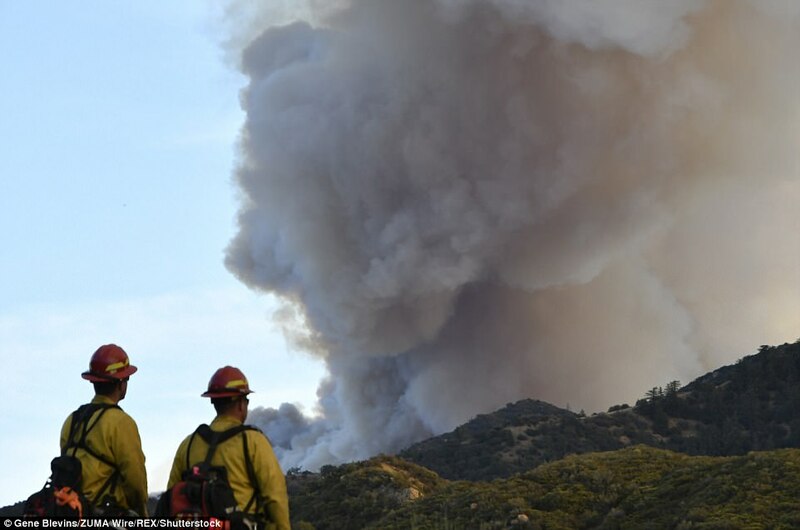 The blaze spread over the weekend in the mostly uninhabited Los Padres National Forest, and was threatening the coastal towns of Montecito, Summerland and Carpinteria. Mandatory evacuation orders were lifted for the inland cities of Ojai and Santa Paula in Ventura County, which has been the hardest hit by the Thomas Fire. Comedian and talk show host Ellen DeGeneres was among those fleeing the flames. ‘Our house is under threat of being burned,’ DeGeneres said on Twitter. ‘We just had to evacuate our pets. May Osher, a 66-year-old retired schoolteacher in Carpinteria, told the Los Angeles Times she had put photo albums and pet supplies in her car and was ready to evacuate if told to do so. ‘I’m staying until it’s time to go,’ Osher told the newspaper. Cal Fire said 800 buildings have been destroyed by the fire, which is being fueled by tinder dry brush and strong and unpredictable Santa Ana winds. Despite the intensity of the fires stretching from north of Los Angeles down to San Diego, authorities have reported only one fatality – a 70-year-old woman who died in a car crash while fleeing a blaze. Brown has been one of the most vocal critics of President Donald Trump’s decision to pull the United States out of the Paris accord on global warming, and he renewed his attacks on the administration over its attitude toward climate change. ‘Nature is not a political game. Nature is the ground on which we stand, it’s the air which we breathe,’ he said. 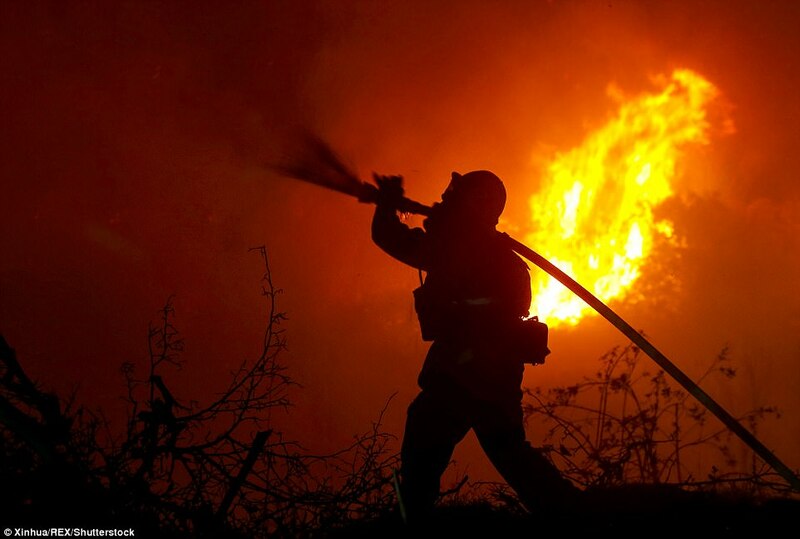 This has been California’s deadliest year ever for wildfires. More than 40 people died in October when fires swept through the state’s wine-producing counties north of San Francisco.